A catwalk (or fashion runway) is the popular place for showcasing fashion design, especially at fashion shows. Catwalk at Berlin Fashion Week for Michalsky's StyleNite. Fashion designers may work full-time for one fashion house, as 'in-house designers', which owns the designs. They may work alone or as part of a team. Freelance designers work for themselves, selling their designs to fashion houses, directly to shops, or to clothing manufacturers. The garments bear the buyer's label. Some fashion designers set up their own labels, under which their designs are marketed. Some fashion designers are self-employed and design for individual clients. Other high-end fashion designers cater to specialty stores or high-end fashion department stores. These designers create original garments, as well as those that follow established fashion trends. Most fashion designers, however, work for apparel manufacturers, creating designs of men's, women's, and children's fashions for the mass market. Large designer brands which have a 'name' as their brand such as Abercrombie & Fitch, Justice, or Juicy are likely to be designed by a team of individual designers under the direction of a design director. Fashion designers work in different ways. Some sketch their ideas on paper, while others drape fabric on a dress form. When a designer is completely satisfied with the fit of the toile (or muslin), he or she will consult a professional pattern maker who then makes the finished, working version of the pattern out of card or via a computerized system. The pattern maker's job is very precise and painstaking. The fit of the finished garment depends on their accuracy. Finally, a sample garment is made up and tested on a model to make sure it is an operational outfit. Fashion design is generally considered to have started in the 19th century with Charles Frederick Worth who was the first designer to have his label sewn into the garments that he created. Before the former draper set up his maison couture (fashion house) in Paris, clothing design and creation was handled by largely anonymous seamstresses, and high fashion descended from that worn at royal courts. 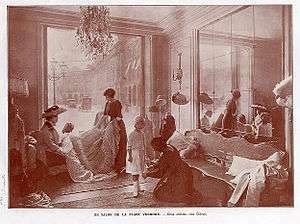 Worth's success was such that he was able to dictate to his customers what they should wear, instead of following their lead as earlier dressmakers had done. The term couturier was in fact first created in order to describe him. While all articles of clothing from any time period are studied by academics as costume design, only clothing created after 1858 is considered as fashion design. Median annual wages for salaried fashion designers were $61,160 in May 2008. The middle 50 percent earned between $42,150 and $87,120. The lowest 10 percent earned less than $32,150, and the highest 10 percent earned more than $124,780. Median annual earnings were $52,860 (£28,340) in apparel, piece goods, and notions - the industry employing the largest numbers of fashion designers. There are a number of specialized art schools and design schools worldwide that offer degrees in fashion design and fashion design technology. Some colleges also offer Masters of Fashion courses. Elsewhere in the world, Shih Chien University and Fu Jen Catholic University in Taiwan and the Asian University chain, Raffles College of Design and Commerce, all offer fashion design courses. There are many universities that offer fashion design throughout the United States, usually within the context of a general liberal arts degree. The major concentration incorporating fashion design may have alternative names like Apparel and Textiles or Apparel and Textile Design, and may be housed in departments such as Art and Art History, or Family and Consumer Studies. Some schools, such as Parsons, offer a major in Fashion Management, combining fashion education with business courses. Fashion today is a global industry, and most major countries have a fashion industry. China and Bangladesh are the biggest manufacturers of clothing, and other notable clothing manufacturing countries are Germany, Indonesia, Malaysia, India, Philippines, South Korea, Spain, and Brazil. The "big four" centres of the fashion industry are Paris, Milan, New York City and London. Seven countries have established an international reputation in fashion: France, Italy, Germany, the United Kingdom, the United States, Japan, and Belgium. Men pulling carts of women's clothing in the Garment District, New York City in 1955. Most American fashion houses are based in New York City, with a high concentration centered in the Garment District neighborhood. On the west coast, there are also a significant number of fashion houses in Los Angeles, where a substantial percentage of high fashion clothing manufactured in the United States is actually made. Beverly Hills, particularly on Rodeo Drive, is globally renowned for its fashion design and prestigious shopping. Burgeoning industries in Miami, Chicago, Dallas, and especially San Francisco have developed as well. A semi-annual event held every February and September, New York Fashion Week is one of four major fashion weeks held throughout the world. Parsons The New School for Design, located in the Greenwich Village neighborhood of Lower Manhattan in New York City, is considered as one of the top fashion schools in the world. American fashion design is dominated by a clean-cut, urban, casual style; reflecting the athletic, health-conscious lifestyles of urban city-dwellers. A designer who helped to set the trend in the United States for sport-influenced day wear throughout the 1940s and 50s was Claire McCardell. Many of her designs have been revived in recent decades. Famous American brands and designers include Vera Wang, Bill Blass, Calvin Klein, Bob Mackie, Anna Sui, Ralph Lauren, Oscar de la Renta, Carolina Herrera, Michael Kors, Marc Jacobs, Tom Ford, Tommy Hilfiger, Geoffrey Beene, Oleg Cassini, Perry Ellis, Kenneth Cole, James Galanos, Todd Oldham, Donna Karan, Liz Claiborne, and Nolan Miller. In the late 80s and early 90s, Belgian fashion designers brought a new fashion image that mixed East and West, and brought a highly individualised, personal vision on fashion. Well known Belgian Designers are the Antwerp Six : Ann Demeulemeester, Dries Van Noten, Dirk Bikkembergs, Dirk Van Saene, Walter Van Beirendonck and Marina Yee, as well as Maison Martin Margiela, Raf Simons, Bruno Pieters. London has long been the capital of the United Kingdom fashion industry and has a wide range of foreign designs which have integrated with modern British styles. Typical, British design is smart but innovative yet recently has become more and more unconventional, fusing traditional styles with modern techniques. Vintage styles play an important role in the British fashion and styling industry. Stylists regularly 'mix and match' the old with the new, which gives British style that unique, bohemian aesthetic that many of the other fashion capitals try to imitate. Irish fashion (both design and styling) is also heavily influenced by fashion trends from Britain. Famous British brands and designers include Burberry, Paul Smith, Alfred Dunhill, Alexander McQueen, John Galliano, John Richmond, Neil Barrett, Matthew Williamson, Hussein Chalayan, Gareth Pugh, Stella McCartney, Mulberry, Thomas Pink and Vivienne Westwood. Toronto holds annual fashion shows to showcase what its fashion designers have to offer. Most French fashion houses are in Paris, which is the capital of French fashion. Traditionally, French fashion is chic and stylish, defined by its sophistication, cut, and smart accessories. French fashion is internationally acclaimed. Berlin is the center of fashion in Germany (prominently displayed at Berlin Fashion Week), while Düsseldorf holds Europe's largest fashion trade fairs with Igedo. Other important centers of the scene are Munich, Hamburg, and Cologne. German fashion is famed for its elegant lines as well as unconventional young designs and the great variety of styles. Globally renowned fashion designers from Germany are Karl Lagerfeld, Hugo Boss, Wolfgang Joop, Jil Sander, Michael Michalsky, Etienne Aigner, Rudolph Moshammer, Torsten Amft, Willy Bogner, Philipp Plein, and Stephanie Hahn . Famous fashion brands include 22/4 HOMMES FEMMES, Hugo Boss, adidas, PUMA, Escada, JOOP!, MCM, Bruno Banani, Jil Sander, Triumph International, Schiesser, Closed GmbH, Reusch, Valisere, Jack Wolfskin, Ulla Popken, Buffalo, Rohde Shoes, Zalando, Dr. Martens, P&C, Marc O'Polo, Tom Tailor, s.Oliver, Esprit, and Wunderkind. Milan is Italy's fashion capital. Most of the older Italian couturiers are in Rome. However, Milan and Florence are the Italian fashion capitals, and it is the exhibition venue for their collections. Italian fashion features casual and glamorous elegance. Most Japanese fashion houses are in Tokyo. The Japanese look is loose and unstructured (often resulting from complicated cutting), colours tend to the sombre and subtle, and richly textured fabrics. Famous Japanese designers include Kenzo Takada, Issey Miyake, Yohji Yamamoto and Rei Kawakubo. Hong Kong clothing brand Shanghai Tang's design concept is inspired by Chinese clothing and set out to rejuvenate Chinese fashion of the 1920s and 30s, with a modern twist of the 21st century and its usage of bright colours. As of today, there are many fashion designers in the region of China, Hong Kong and Macau. Fashion in the Soviet Union largely followed general trends of the Western world. However, the state's socialist ideology consistently moderated and influenced these trends. In addition, shortages of consumer goods meant that the general public did not have ready access to pre-made fashion. Most of the Swiss fashion houses are in Zürich. The Swiss look is casual elegant and luxurious with a slight touch of quirkiness. Additionally, it has been greatly influenced by the dance club scene. Fashion Design Services provide services like trend and color forecasting, market analysis, design concepts & design documentation etc. for manufacturers. This way the manufacturer can contract out the design requirements & get the design job done rather than maintaining an in-house design team. Fashion Design services provider can either sell the designs outright or license them out on royalty basis. If someone is interested in launching their own line in footwear, handbag, bedding etc. and are looking to outsource the design work, then a fashion design services provider can help. While initially launching the business, it might be expensive to launch with a lot new designs, thus a licensing option from such a company might save startup cost. A fashion designer conceives garment combinations of line, proportion, color, and texture. While sewing and pattern-making skills are beneficial, they are not a pre-requisite of successful fashion design. Most fashion designers are formally trained or apprenticed. A technical designer works with the design team and the factories overseas to ensure correct garment construction, appropriate fabric choices and a good fit. The technical designer fits the garment samples on a fit model, and decides which fit and construction changes to make before mass-producing the garment. A pattern maker (or pattern cutter) drafts the shapes and sizes of a garment's pieces. This may be done manually with paper and measuring tools or by using a CAD computer software program. Another method is to drape fabric directly onto a dress form. The resulting pattern pieces can be constructed to produce the intended design of the garment and required size. Formal training is usually required for working as a pattern marker. A tailor makes custom designed garments made to the client's measure; especially suits (coat and trousers, jacket and skirt, et cetera). Tailors usually undergo an apprenticeship or other formal training. A textile designer designs fabric weaves and prints for clothes and furnishings. Most textile designers are formally trained as apprentices and in school. A stylist co-ordinates the clothes, jewelry, and accessories used in fashion photography and catwalk presentations. A stylist may also work with an individual client to design a coordinated wardrobe of garments. Many stylists are trained in fashion design, the history of fashion, and historical costume, and have a high level of expertise in the current fashion market and future market trends. However, some simply have a strong aesthetic sense for pulling great looks together. A fashion buyer selects and buys the mix of clothing available in retail shops, department stores, and chain stores. Most fashion buyers are trained in business and/or fashion studies. A seamstress sews ready-to-wear or mass-produced clothing by hand or with a sewing machine, either in a garment shop or as a sewing machine operator in a factory. She (or he) may not have the skills to make (design and cut) the garments, or to fit them on a model. A teacher of fashion design teaches the art and craft of fashion design in art or fashion school. A custom clothier makes custom-made garments to order, for a given customer. A dressmaker specializes in custom-made women's clothes: day, cocktail, and evening dresses, business clothes and suits, trousseaus, sports clothes, and lingerie. An illustrator draws and paints clothing designs for commercial use. A fashion forecaster predicts what colours, styles and shapes will be popular ("on-trend") before the garments are on sale in stores. A model wears and displays clothes at fashion shows and in photographs. A fit model aids the fashion designer by wearing and commenting on the fit of clothes during their design and pre-manufacture. Fit models need to be a particular size for this purpose. A fashion journalist writes fashion articles describing the garments presented or fashion trends, for magazines or newspapers. An alterations specialist (alterationist) adjusts the fit of completed garments, usually ready-to-wear, and sometimes re-styles them. NOTE: despite tailors altering garments to fit the client, not all alterationists are tailors. An Image Consultant, wardrobe consultant or fashion advisor recommends styles and colors that are flattering to the client. ↑ Hebrero, Miguel (2015). Fashion Buying and Merchandising: From mass-market to luxury retail. London: Createspace. p. 64. ISBN 978-1517632946. ↑ Bethan Cole (2 May 2012). "Kitsch pickings" (Article). Financial Times Online: Style. The Financial Times Ltd. Retrieved 13 May 2012. ↑ "Fashion Designers". Occupational Outlook Handbook. U.S. Bureau of Labor Statistics. Retrieved 13 May 2012. ↑ "The World's 25 Best Design Schools - Business Insider". Business Insider. 23 November 2012. 1 2 3 4 5 6 7 8 9 10 11 "Top Fashion Schools Around the World". Top Universities. 1 2 3 4 5 6 7 8 9 "Best fashion schools in the world". spearswms.com. ↑ "Designschule Schwerin: Gamedesign, Modedesign, Kommunikationsdesign". designschule.de. ↑ "India's Best Fashion Colleges 2013". India Today. 2013. ↑ "Apparel and Textiles: Fashion Retail". ua.edu. Retrieved 17 May 2016. ↑ "Resources: fashion graduate programs". ITAA. Retrieved July 28, 2014. ↑ Broun, Samantha (6 April 2006). "Designing a global brand". CNN World. Retrieved 2 June 2012. ↑ "Zurich labels". Zurich labels: Media Information. Zurich Tourism. January 2012. Retrieved 13 May 2012.